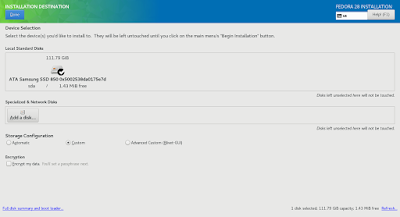 This is a basic guide to install Fedora 28 on Mac Mini (late 2009) version. 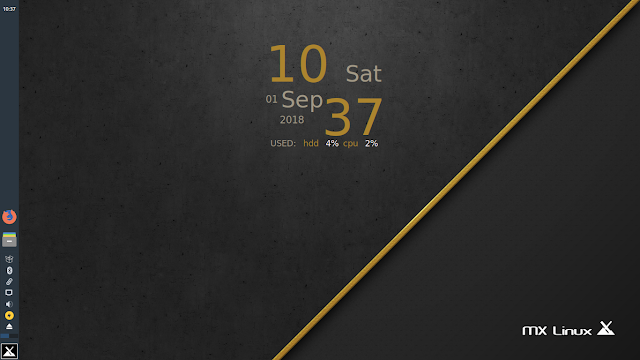 This version is quite unstable as we received message that our boot image crash. 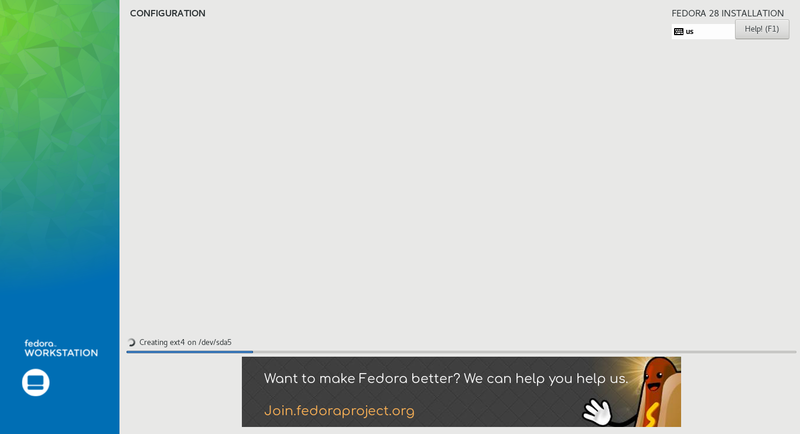 Despite the error message, we manage to get Fedora to work. 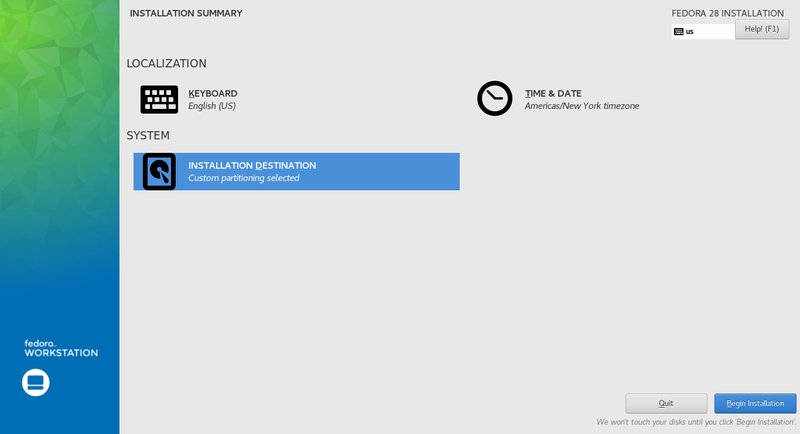 To prepare a Fedora USB drive, we can download the Fedora Media Writer App. 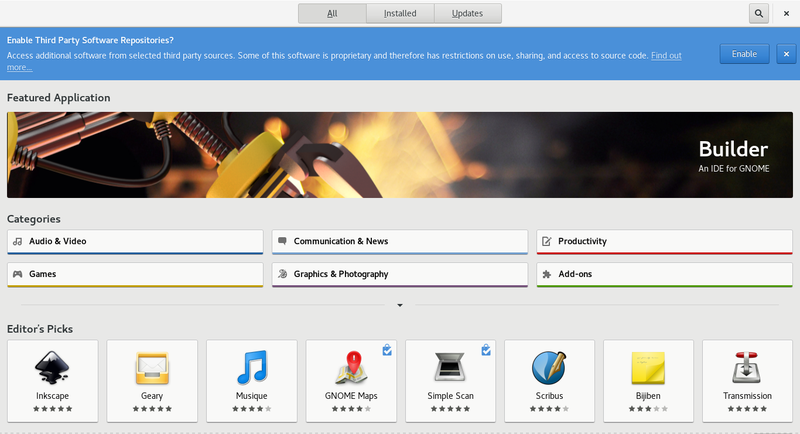 Using this app, we can download Fedora and burn the image to the USB drive directly. Bootup from USB using option (Alt) key. 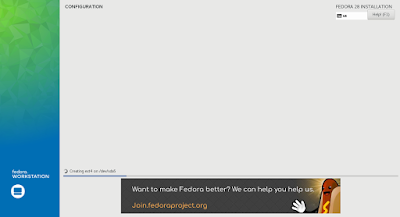 Then select Try Fedora 28. Once the live image is booted, we can use the disk app to remove any partition that we want to get rid of. Alternatively, we can do that during installation. Select the appropriate language, click Continue. 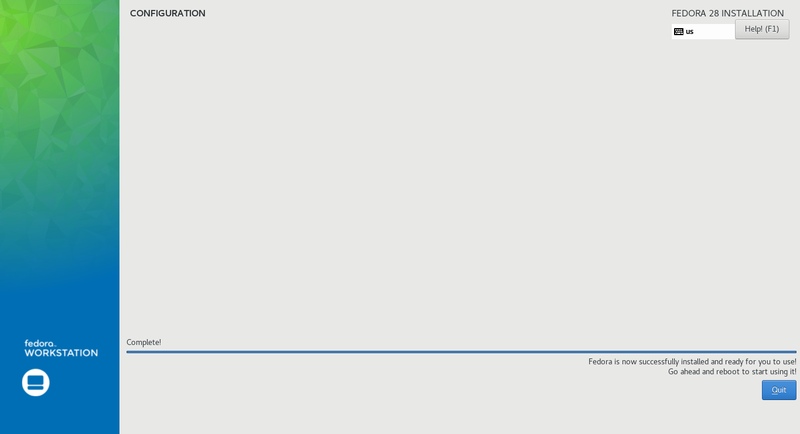 You will be presented with something similar to the following screen, except that the disk was not defined. We can change the time zone and keyboard if we think the automated selection is wrong. Under System, click on Installation Destination to configure the drive. Select the disk if you have more than one disk. Then choose if you would want the system to configure the drive automatically for you. We select custom and click Done. If you find defining partition is a hassle, you can allow the system to configure for you automatically. If you have not remove any unwanted partition, you will be ask to reclaim disk space. Click Done when ready. We will be brought back to the main configuration screen. Please note that as long as there is a red warnings message, we cannot proceed with the installation. We are good for installation only when all read messages are gone. Once we are ready, click Begin Installation. The installation will proceed as shown above. Once it is completed, we can click Quit as shown below. Reboot the system when ready. During the first boot, we are given the chance to create user ID and even make connection to external storage services. We usually just create the user ID. We can start using Fedora when we have create the ID. Once the update is completed, reboot the system. We can enable additional repository from the Software app. Open the app as shown below. Notice that There is a blue banner for us to enable additional repository. Click to enabled that. Next, we select Software Repositories from the drop down menu at the top. 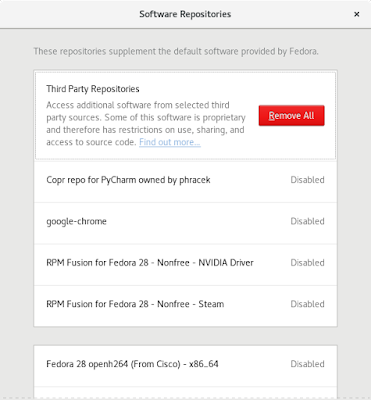 We can enable or disable each repository. Most of the software can be install via Software app. 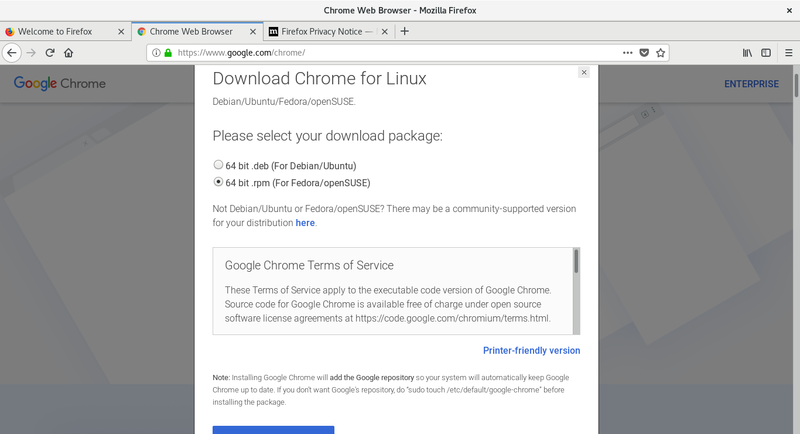 We need to download Chrome separately from Google site. 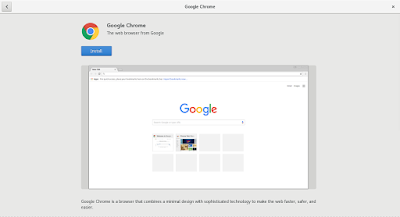 Please note that Chromium and Chrome is different product. 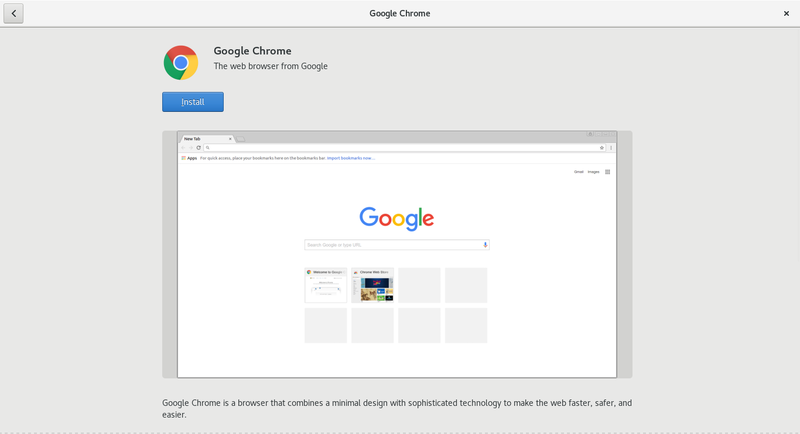 Chromium is the opens source web browser, Google Chrome is Google web browser that are tightly integrated with Google services. 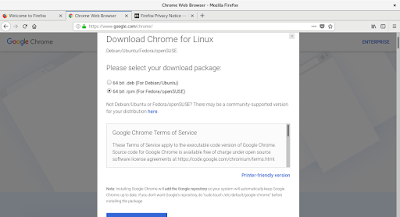 Download the package that indicate 64bit Fedora. Click Accept and Install. Once the software is downloaded, click Install as shown below. Please note that we have no luck in installing any Broadcom wifi drivers. If wifi is a must please get another wifi adapter. Alternatively, you can attempt to build and driver yourself.